(CNN) -- Arsenal striker Emmanuel Adebayor returned from injury to score the winner as Togo rocked Cameroon 1-0 Saturday at the start of the final 2010 World Cup-African Nations Cup qualifying phase. 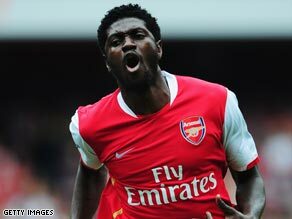 Arsenal striker Emmanuel Adebayor scored the World Cup winner for Togo on his return from injury. The 25-year-old has been out since the start of February with a hamstring injury suffered against Tottenham, but kept his promise to play for his country and struck just 11 minutes into the first half. Victory was particularly sweet for Togo as they are 22 places below five-time World Cup qualifiers Cameroon on the FIFA African rankings and had to stage a home fixture in neutral Accra. But the 45,000-seat Ohene Dyan Stadium in the Ghana capital is a happy hunting ground for Adebayor who scored four goals against Swaziland there in the previous round. Togo were forced to move the Group A fixture because of a FIFA ban on playing in Lome after Mali players and supporters were attacked after winning a 2008 Nations Cup qualifier. Burkina Faso and Tunisia also impressed as the six-round third qualifying stage began with six matches followed by another four Sunday when giants Egypt, Ivory Coast, Ghana and Nigeria play. The Burkinabe Stallions have not looked back since Portuguese coach Paulo Duarte joined them, finishing the previous round unbeaten after launching their campaign by stunning the Tunisian Carthage Eagles 2-1 in Rades. Duarte claimed Guinea would pose a bigger Group E threat than top seeds Ivory Coast, but that appeared a bit farfetched as his side romped to a 4-2 Ouagadougou triumph. Qatar-based leading qualifying scorer Moumouni Dagano raised his goal haul to nine with a couple during the second half after Mahamoudou Kere and Alain Traore had struck to build a 2-0 half-time advantage. Veteran midfielder Pascal Feindouno and Kanfory Sylla were on target for Guinea, who appear too brittle defensively to challenge for one of five World Cup places at stake. Away wins are precious and Tunisia overcame Kenya 2-1 in Nairobi to make the perfect start in Group B with Issam Jomaa snatching the second-half winner after team-mate Ammar Jemal had an early goal cancelled by Dennis Oliech.